We all know that Samsung isn't exactly a shrinking violet when it comes to smartphones. It has a wide range of handsets, spanning all price points and covering Android, Windows Phone and even its own Bada operating system. Samsung has been in the rugged mobile phone arena before, although only with 'dumb' phones such as the Solid Extreme B2100. Now, though, Samsung seems to have finally noticed the success Motorola has had with its Defy and Defy+, and has decided to jump onto the bandwagon with a rugged handset of its own. The result is the rather heavily named Samsung Galaxy S5690 Xcover Extreme, which you'll probably see referred to as either the Samsung Galaxy Xcover or the Samsung Galaxy Extreme. We're opting for the Samsung Galaxy Xcover for this review. 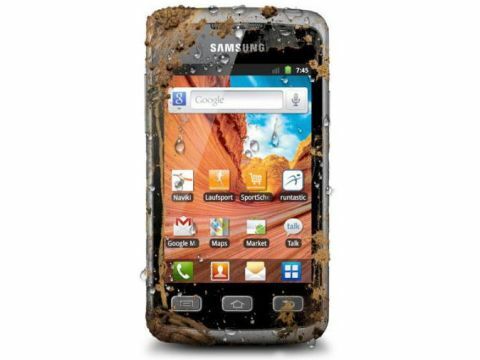 The Samsung Galaxy Xcover is IP67 certified, meaning it's able to survive under a meter of water for up to 30 minutes, and can withstand dust too. Clearly it needs to be well sealed to perform these feats. The sealing looks relatively subtle, but we'll test it later. Both the headset slot on the top and the USB slot along the bottom are protected by hinged covers. The USB slot is also quite recessed, and we had trouble getting our usual 'one size fits all' connector to fit into the hole. The power button on the right and the volume rocker on the left are fairly flush with the chassis, and presumably well protected underneath. The backplate is held firm with a screw-type lock, and even when you release this you need to prise it away. There's a secondary seal around the battery for double protection. The Samsung Galaxy Xcover's screen, of course, is made from Gorilla Glass. The handset is a somewhat chunky beast, measuring 121.5 x 65.9 x 11.95mm and weighing 135g. There is a lot of unused space above and below the screen that makes it seem a bit over-engineered, and the 3.65-inch screen looks a little lost. Beneath the screen are three fairly large buttons for Home, Back and Menu. Yes, they're well sealed against water and dust, but this doesn't in any way affect their comfy feel under the fingers. Look closely at the volume rocker, incidentally, and you'll see a torch icon. Hold this end of the rocker down and you can toggle the camera LED for use as a, well, as a torch. Specs-wise, Samsung hasn't really pushed the boat out with the Galaxy Xcover. Android is version 2.3 Gingerbread. The 800MHz processor isn't what we'd call state of the art, and with just 150MB of free storage you'll need a microSD card almost immediately. The camera is another letdown, offering just 3.1MP of shooting power. Considering that Clove, who supplied our review sample, is selling the Samsung Galaxy Xcover for £226.80 SIM-free in the UK, then maybe these specs are to be expected. In the US, we found it priced at $385 SIM-free on Amazon. There's also the usual GPS, Wi-Fi and HSDPA on the Samsung Galaxy Xcover.